Despite two recent conference losses, the men's basketball team looks forward to tournament play. The men’s basketball team struggled to string together wins late in the season. They are currently sitting in seventh place in the Crossroads League with a 13-16 overall record and 7-10 conference record. Going into their final regular season game, however, the Foresters locked up a spot in the conference tournament as the top eight are admitted to the playoffs. They hosted the Taylor Trojans Feb. 20 to cap off a tough year in the ever-competitive Crossroads League. Woll, going into the Foresters’ game against Taylor, was leading all Forester scorers for this season with a 17 points-per-game average. He also pulls down a team-high 7.3 rebounds per game. The Foresters hosted Bethel College on Feb. 9th and put up an admirable fight against the #11 Pilots but fell short, resulting in a 103-100 overtime loss. Woll led the Foresters that night with 29 points, along with seven rebounds and seven assists. Devon Merder also had a big night for the Foresters, going four to five from three-point land to end with 20 points, five rebounds and four assists. Derek Hinen and Austin Karazsia had 15 and 12 points, respectively. Bethel was just too much for HU to handle as the Pilots shot 51% for the game and out-rebounded the Foresters 39-35. 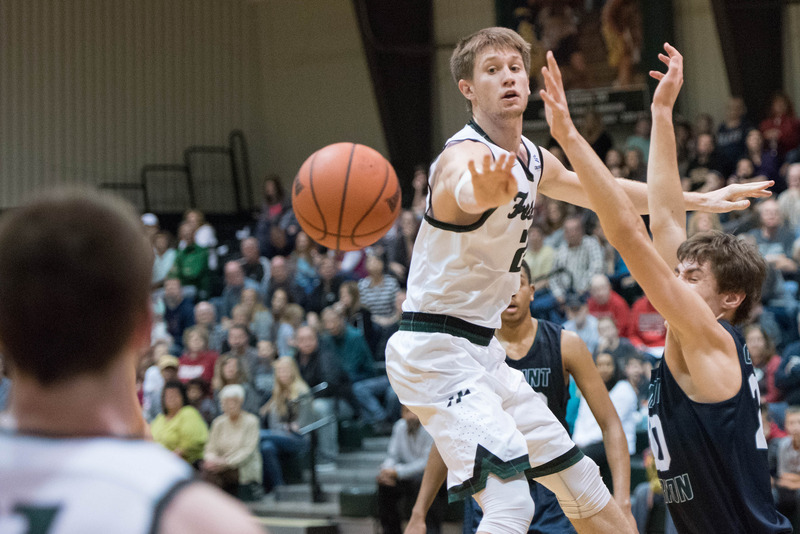 The loss continued a five-game losing streak for the Foresters. On Feb. 13, the men’s team traveled to Mount Vernon Nazarene University and battled the Cougars but came home with a 82-67 loss. Hinen led with 23 points and four assists, and Devon Merder chipped in nine points and four assists. Drew Benedict also found double digit scoring with 10 points. The Foresters shot 40% for the game, while Mount Vernon shot 46%. Both teams shot and made the exact same number of three-pointers, each going 7-25 from beyond the arc. The squad said that the season, though a challenge at times, will benefit them as they face tough post-season play and the upcoming season. The Foresters traveled to Marion Feb. 24. as a number-seven seed to play #4 IWU in the first round of conference tournament play on Feb. 24.